Oleg Eduardovich Berlov, the most active and most popular author of our site and one of the most active members of its editorial board, proposed a new large-scale initiative to establish on our site an illustrated atlas of all beetles of Russia covering all families of Coleoptera of the entire territory of our country. This is not the first large project of O.E. Berlov. The Atlas of ground beetles of Russia initiated by him has been successfully developed on our site for several months. Unfortunately it has not yet become a collective work. Then O.E. Berlov proposed to create an atlas of cerambycids of Russia; and even though his scientific interests are far from cerambydology, he himself began filling it with excellent scanographs. This idea was taken up by our Polish friend and colleague Szczepan Ziarko also skilful in scanning beetle images. The competition of the two masters was joined by D.G. Kasatkin quickly catching up with his senior colleagues in scanning technique. M.L. Danilevsky and A.I. Miroshnikov presented their photographic works for the atlas. I began filling the most difficult "white spots" myself finding the images on the Internet and in books. As a result the atlas of cerambycid beetles has become a collective project and is developing successfully. Thus, O.E. Berlov may expect that his idea to compile an atlas of all beetles will be supported by a wide range of coleopterists. It is difficult to solve such a large-scale task without participation of those who can photograph or scan collection specimens. The fauna of Russia lists approximately 15,000 species of beetles of 137 families. The number of genera is unknown, but most probably it can be measured in thousands. The editorial board of the site hopes that the proposal of O.E. Berlov to create for the 100th anniversary of the largest collection of beetle images in Russia a unique atlas on the Internet will be supported by coleopterists and beetle lovers. You are encouraged to write and send images of beetles and whole pages for the atlas to the coordinator of the project O.E. Berlov! The collective project "Atlas of beetles of Russia is dedicated to the 100th anniversary of the first publication of the grandiose work by G.G. Jacobson, his monograph "Beetles of Russia, Western Europe and Neighbouring Countries" (1905-1916). .
who can compile lists of genera and species of fauna of Russia, and write species essays. Sponsors and advertisers are also invited. At present electronic "Atlas of Beetles of Russia" contains a large number of "white spots", but I hope that by 2005 the Atlas will include colour images of representatives of all families, subfamilies and tribes, of the majority of genera and many species of beetles of fauna of Russia. In order to at least partly reduce the number of empty frames for photographs the index will use contour drawings of representatives of families from different sources. Such images will be a reminder to all participants of the project to replace them by original photographs or scanographs! 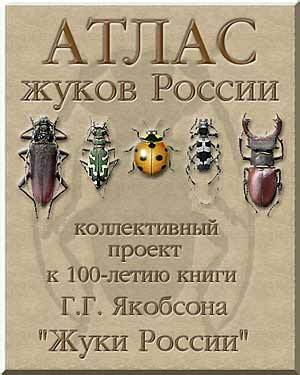 You are encouraged to participate in creation of "The Atlas of Beetles of Russia"! We have at our disposal two years and a half for the realization of the interesting project having no analogies in the "World Web". This is a long and a short period at the same time! We look forward to receiving your materials!!! The index includes 22 scanographs of Oleg Berlov, a drawing from his book "Key to Freshwater Invertebrates of Russia" (Vol. 5, SPb, 2001) and figures from the book "Die Kaefer Mitteleuropas" (Band 6, Krefeld, 1979).